The 2nd Annual Tejano Music Fest in Cathedral City happens on Saturday, September 22nd from 5 pm to 10 pm in front of City Hall, but join us on Friday, September 21st from 5:00 pm to 11:00 pm at the Mary Pickford Theatre for “Cultural Explosion” – the kick-off event for the Tejano Music Festival. You will enjoy the Best of the Best film from LA’s “Hola! 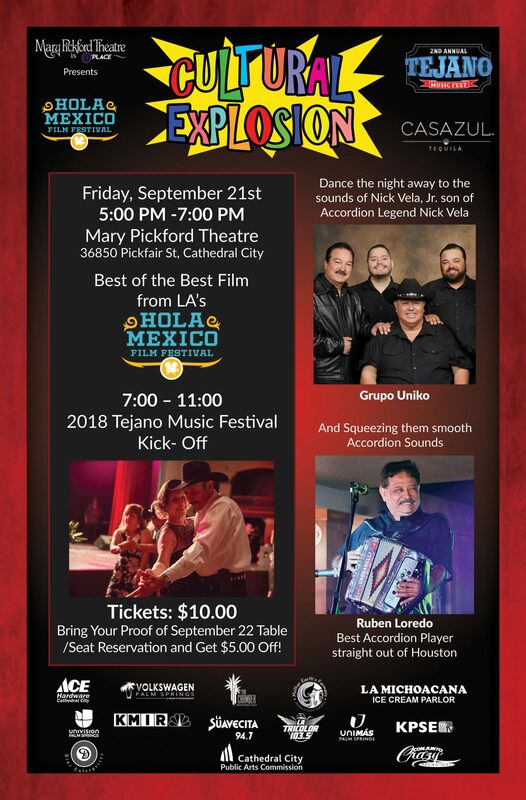 Mexico Film Festival”followed by a dance party featuring the sounds of Nick Vela Jr. (son of Accordion Legend Nick Vela), the music of “Grupo Uniko” and the accordion sounds of Ruben Loredo, Best Accordion Player – Houston, TX. “Cultural Explosion” tickets are purchased at the Mary Pickford Theatre – day of and at the door.